Food Safety Supervisor NSW Certificate - Buy Now & Save! Get your Food Safety Supervisor NSW online course for only $115 - no more to pay! Buy Now to Register for your Online FSS NSW Course & get your Green & White NSW Food Safety Supervisor Certificate fast! Complete your Food Safety Supervisor NSW Course Online & get your NSW Food Authority Green & White Certificate. This Online Food Safety Supervisor NSW course provides two nationally recognised certificates for SITXFSA001 Use Hygienic Practices for Food Safety & SITXFSA002 Participate in Safe Food Handling Practices as well as the official NSW Food Authority Green & White Certificate. This official NSW Food Safety Supervisor Course allows you to work with food safely in the retail, hospitality, transport and distributions sectors in NSW. Please note: your details (First and last name) will be sent to the NSW Government Food Authority for the issuing of the Food Safety Certificate. There are 2 Core Sections in the online Food Safety Supervisor Course NSW to complete followed by a final assessment. Plus, additional information on Allergen and Egg Management for NSW Food Safety. Download the SITXFSA001 Use Hygienic Practices for Food Safety qualification information and the SITXFSA002 Participate in Safe Food Handling Practices qualification information for the full course details. Please allow approximately nine (9) to ten (10) hours to complete your online training course plus time for practical assessment. Each State in Australia has its own legislation governing safe food handling. This course is approved by the NSW Food Safety Authority for NSW Food Safety Supervisors. This course is also nationally recognised and these competency standards are in alignment with the current national food safety training agenda and are approved by the National Quality Council (Department of Education, Science and Training). Important Note for NSW: Club Training Australia is an approved trainer for Food Safety Supervisor online training in NSW therefore this qualification applies to NSW hospitality businesses. Provided we have a verified USI number, as soon as you complete and upload your Final Assessments and they are marked as competent by one of our assessors, you will be issued with your nationally recognised Statement of Attainments via email. You will also be able to download the certificates via the Club Training Australia student portal. Please note that you will receive a printed green & white Food Authority Certificate in the mail (to the residential address provided on enrolment of the course) within ten (10) business days of completion. 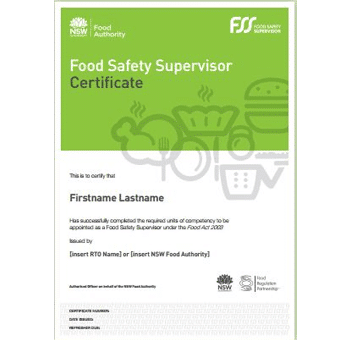 Who needs a NSW Food Safety Supervisor Certificate? The Food Act 2006 (the Act) requires every licensed food business to have a Food Safety Supervisor. Every licensed food business in NSW must provide to the NSW Government (NSW Food Authority) information regarding the food safety supervisor for that business. NOT sold and served in the supplier’s original package. Examples of businesses* include restaurants, cafés, takeaway shops, caterers, bakeries, pubs, clubs, hotels and supermarket hot food sales. Please view the NSW Food Authority website for more information. Is the online NSW Food Safety Supervisor training course accepted in all Australian States and Territories? The Club Training Australia’s SITXFSA001 Use Hygienic Practices for Food Safety and SITXFSA002 Participate in Safe Food Handling Practices online training course meets the requirements of the Australian Quality Training Framework and is a nationally recognised unit. The Australian Quality Training Framework (AQTF) is the national set of standards which assures nationally consistent, high-quality training and assessment services for the clients of Australia’s vocational education and training system. This Food Safety Supervisor course is recognised in the following states; NSW, QLD, WA, VIC, NT & SA. The Food Safety Supervisor online training course is $115, which includes your official NSW Food Authority Food Safety Supervisor Certificate and live support from our qualified trainers and assessors. There’s no more to pay! Please note: Your printed Green & White Food Authority Certificate will be issued within ten (10) days of successful completion of the course via Australia Post (to the residential address provided on enrolment of the course). It is the student’s responsiblity to ensure that the correct residential address is provided on enrolment. Should the student require a reprint of the Green & White Food Authority Certificate, the cost is $50 which includes the $30 certificate fee from the NSW Food Authority plus any associated postage/administrative fees. What if I fail my assessment? 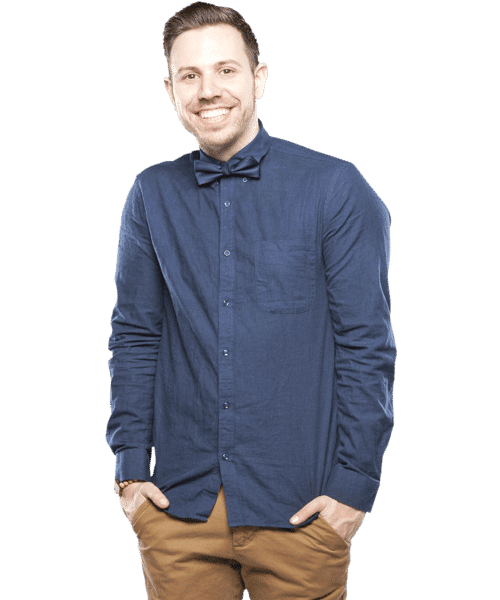 Will I lose my money? No, our trainers and assessors are there to help you succeed and pass your course. We will work with you and help you if you are having trouble with the online Food Safety Supervisor course. You won’t need to pay any more. When does your Food Safety Certificate expire? The NSW Food Safety Supervisor certificate will expire five (5) years from the date of issue. You must complete your NSW Food Safety Supervisor Re-certification Training prior to this time to keep your certificate current. It is highly recommended that you have more than one team member that holds a current Food Safety Supervisor qualification.